Bleaching a black t-shirt is producing orange – How can I get white? I have a project that I am trying to achieve a certain garment treatment. I am attaching an image of the design. I have tried using bleach on a black garment but end up with an orange under-color and my client is looking to get it as close to white as possible – see picture. Do you have any other treatment suggestions on how to achieve this look? Your picture of the desired results [shown to the right] appears to show the use of an opaque white screen-printing ink. The white is so bright and so devoid of variation that it doesn’t have the look of bleached-out dye, to me. Discharging black garments is a perennial problem. Most commercially-available black garments are dyed with unidentified dyes that will discharge unpredictably. The spider-web pattern on this navy blue shirt discharged with bleach to a pink color. Unless a shirt is sold with specific claims as to dischargeability, you never know whether it will discharge to white, or to an aged-looking orange or brown, or even refuse to discharge at all, remaining black. Some dyes cannot be discharged at all. Black garments may have been originally intended to be black, or they may have been overdyed with black dye after dyeing with another color produced undesirable results; if the other colors are non-dischargeable, you could get an entirely unpredictable color. A supply of black blanks may discharge well and then suddenly, after many successful uses, be replaced, with absolutely no notice from the manufacturer, by black shirts that do not discharge acceptably! 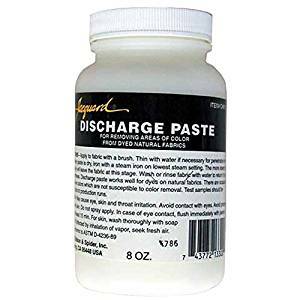 To complicate matters, while results will be pretty much the same with one reducing-type discharge as another, the results may be very different from those obtained by discharging with an oxidative discharge such as chlorine bleach or dichloroisocyanurate. Bleach may produce an entirely different color than a reductive discharge. 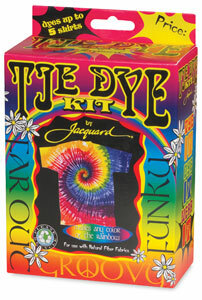 For more information on this, see my page, “What chemicals can be used to remove dye?”. If you ever use Procion dyes yourself before discharging, also check out my page “Which Procion MX dyes discharge the best? Which are good at resisting chlorine bleach?”. I recommend that you search specifically for a dischargeable black blank t-shirt for dyeing. There are some on the market. Ask your current suppliers if they can supply you with some, or do a search including the word “dischargeable” to locate another supplier. Alternatively, consider the use of an opaque white screenprinting ink. For example, Jacquard Professional Screenprinting Ink in the color “Super Opaque White” gets good reviews for being very opaque, though I don’t have personal experience with it. fiber reactive colors, direct dyes and acid dyes from fabric. Apply with a brush, iron with steam and wash out. This entry was posted in discharge and bleach on February 16, 2017 by pburch. Why won’t my wool take up dye? So far, every time, the answer to this question has always been that the fiber was mislabeled as wool, when it was actually a synthetic fiber, such as acrylic. Have you used this exact same dyeing procedure in the past with success? If you still have your dyebath, please try some samples of other wool that you may have to see if it takes up more color. It is surprising how processed wool can be, and yet continue to dye very well. For example, Superwash wool is processed by being chlorinated and then treated with a sort of plastic, a polymer resin called Hercosett 125, that glues down the scales that are found on the surface of mammalian hairs (like the scales on our own hair); this enables the wool fibers to be treated roughly without interlocking, shrinking, and felting. You would imagine that such dramatic treatment would interfere with dyeability, wouldn’t you? And yet Superwash wool is excellent for hand dyeing, no problem at all. In fact the processing has obvious benefits in preventing felting or shrinkage, when that’s important. Please let me know if this makes sense, from your observations. 180 Sun Yellow, 380 Scarlet, 483 Royal Blue, and 680 Jet Black. 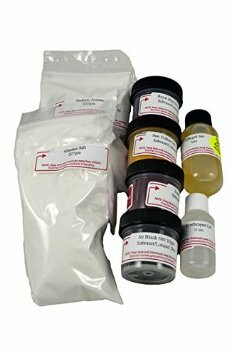 Also includes: Citric Acid Crystals, Sodium Acetate, Glauber salt, Albegnal SET and Synthrapol. This entry was posted in dyeing wool, natural dyes on February 6, 2017 by pburch. Is it possible to bleach this black jacket and dye it yellow? I’m making a cosplay for this character, Yellow Diamond [shown to the left]. My plan is to buy this jacket, which is 72% polyester; 23% rayon & 5% spandex [shown to the right]. 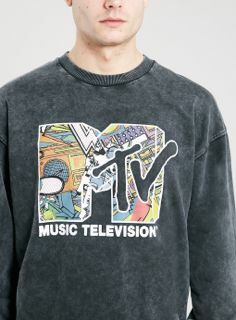 Is it possible to bleach it and then dye it yellow and if so, which method of doing so would you suggest for the best result? Regular bleach or a color remover? Permanent, colorfast, and very washable. You can easily create a palette of brilliant colors ranging from light pastels to deep, vibrant hues. Perfect for all natural fibers–cotton, rayon, linen, silk, wool, paper, reeds, and wood. No, sorry, you can’t bleach that! Chlorine-based bleach will damage the polyester (turning it an ugly yellow that can’t be removed) and break up the spandex. Non-chlorine color removers require heat which will damage the spandex. Besides that, there is never any guarantee that a commercially-dyed black even can be removed by either means. Many black dyes cannot be removed. When bleached, or treated with other color removers, they may stay black, or they may turn an ugly brown, not suitable for dyeing yellow. It’s rare for a commercially-dyed black garment to bleach out to nearly white. Maybe you could build something suitable starting from pieces such as, say, a dyeable rayon jacket and a skirt that you cut up the front (and fold over the edges and sew so that it doesn’t ravel), from Dharma Trading Company, which is an excellent source for dyes and dyeables. 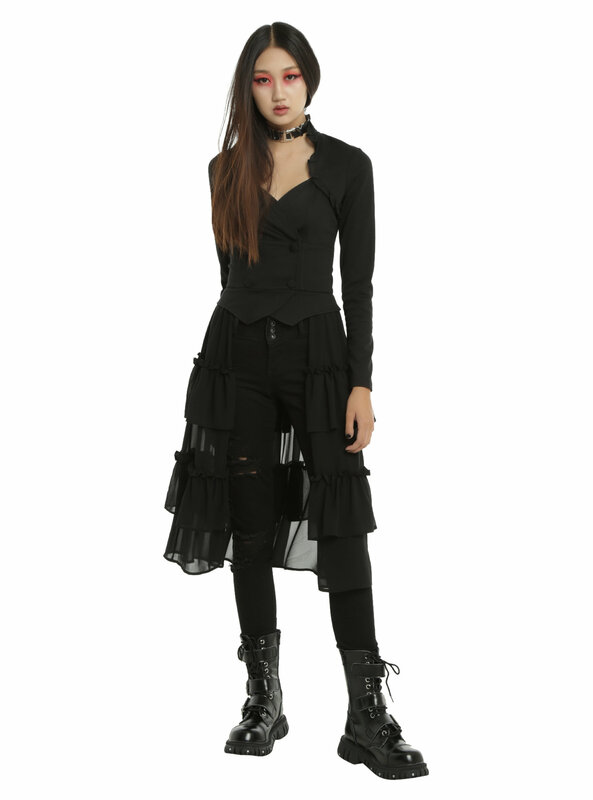 Look at the skirts on the Dharma site and the jackets there, for example, their waterfall jacket. Since they are white, and made of dyeable materials, these clothing items will dye a beautiful yellow. Don’t forget to check out the accessories section to see if they have dyeable gloves, etc. They also have dyeable cotton/spandex leggings. If you buy a yellow Procion fiber-reactive dye and dye several white dyeable clothing black garments at once in the washing machine, it will all match beautifully, which is a great aid in designing a costume. This entry was posted in discharge and bleach on February 1, 2017 by pburch.